For nearly a century, Offutt AFB has played a key role in American military history. From its beginnings as Fort Crook in the late 1800s, Offutt has adapted to the defense needs of the United States. The historical significance of Offutt is a source of pride for military and community members alike. Offutt's great heritage began with the construction of Fort Crook between 1894 and 1896, some 10 miles south of Omaha and two miles west of the Missouri River. The fort's namesake was Maj. Gen. George Crook, a renowned Indian fighter and Civil War hero. Many of the original buildings constructed on the post before 1900, including the guard house and various enlisted and officers quarters, are still in use today. 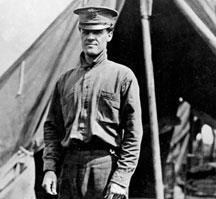 The airfield portion of Fort Crook was designated Offutt Field on May 10, 1924, in honor of 1st Lt. Jarvis J. Offutt. Offutt was killed while flying with the Royal Air Force in France and was Omaha's first World War I air casualty. Years later as American involvement in World War II loomed, the Army Air Corps chose in 1940 Fort Crook as the site for a new bomber plant. The plant's construction included two mile-long concrete runways, six large hangars, and a huge 1.7 million square-foot aircraft-assembly building. The Glenn L. Martin Company began producing bombers in January 1942, with the plant reaching full-scale production June 8, 1942. A total of 531 B-29 Superfortresses and 1,585 B-26 Marauders were built at the Martin-Nebraska bomber plant before the end of World War II. These aircraft included the Enola Gay and Bock's Car, the two B-29s that dropped the atomic bombs on Hiroshima and Nagasaki, Japan. Production ended on Sept. 18, 1945, when the last B-29 rolled out of the assembly building. 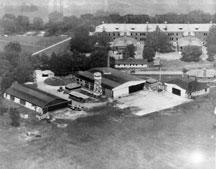 In June 1946, the Army Air Force re-designated Fort Crook and the Martin-Nebraska facilities as Offutt Field. Just 18 months later, on Jan. 13, 1948, Offutt Field transferred to the new Department of the Air Force and became Offutt Air Force Base. Later that same year, on Sept. 26, the 3902nd Air Base Wing became the host unit at Offutt. At one minute past midnight, Nov. 9, 1948, Offutt gained international prominence when it became the host base for Headquarters Strategic Air Command. Air Force Secretary Stuart Symington chose to locate the Air Force's crucial long-range atomic strike force at Offutt primarily because the base was centrally located on the North American continent, placing it well beyond the existing range of potentially hostile bombers or missiles. ballistic missile sites in Nebraska and Iowa in the 1960s, and worldwide reconnaissance from the mid-1960s to the present. The establishment of the Joint Strategic Target Planning Staff in 1960, the Looking Glass airborne command post in 1961, the activation of Air Force Global Weather Central in 1969, and the arrival of the National Emergency Airborne Command Post mission in 1977 further enhanced Offutt's role as a center of military importance. Offutt's population and facilities grew dramatically to keep pace with the increased operational demands. Several new dormitories and more than 2,000 family housing units — built in the late 1950s and 1960s under incremental Wherry and Capehart projects — quickly replaced the old quarters of Fort Crook. Headquarters SAC moved from the Martin-Nebraska complex to Building 500 in 1957, and new base facilities in the 1960s and 1970s included a hospital, main exchange, commissary, and library. The 3902nd Air Base Wing was inactivated March 1, 1986, and the 55th Strategic Reconnaissance Wing assumed host-unit responsibilities. Increased defense spending in the 1980s brought additional operational improvements, including the wing's special operations building, the Bennie L. Davis Aircraft Maintenance Complex, and a new underground command center for Headquarters SAC. Offutt again faced monumental changes in 1992 when the easing of world tensions allowed the United States to reorganize its Air Force. The Strategic Air Command was disestablished June 1, 1992, and a new, unified command, U.S. Strategic Command, was established. With this historic change, the operational control of Offutt became the responsibility of Air Combat Command, another of the Air Force's new commands. In 2002, the Department of Defense announced the merger of U. S. Strategic Command with U.S. Space Command. The new U.S. Strategic Command is tasked with space, information, and computer network operations as well as strategic defense and attack missions. This former Army outpost, once hard-pressed to support a few hundred soldiers, begins its second century of service with the resources and facilities to accommodate a combined military and civilian work force of more than 11,000, while supporting nearly 24,000 family members and retirees.